Daily Press file photo Walt Peterson makes corn on the cob using steam from a 1901 20-horse power Port Huron steam engine during the U.P. Steam and Gas Engine Association's 42nd annual Labor Day show at the Upper Peninsula State Fairgrounds in Escanaba. ESCANABA — From its humble beginnings in 1976, the U.P. Steam and Gas Engine Association’s annual Labor Day weekend show has grown into one of the biggest tractor and historical events in the region. Over 125 exhibitors come from near and far, bringing an ever-changing display of tractors, gas engines and vintage farm equipment. This year marks the 43rd year of the event, which will take place Aug. 31 through Sept. 3 at the association’s Antique Village on the U.P. State Fairgrounds. On Friday, Saturday, and Sunday, the show will be open from 9 a.m. to 5 p.m. On Labor Day Monday, gates will be open from 9 a.m. to 4 p.m. This year, the show will feature oddballs (odd or unique tractors and equipment), orphans (tractors made by manufacturers that have discontinued business entirely), and garden tractors. 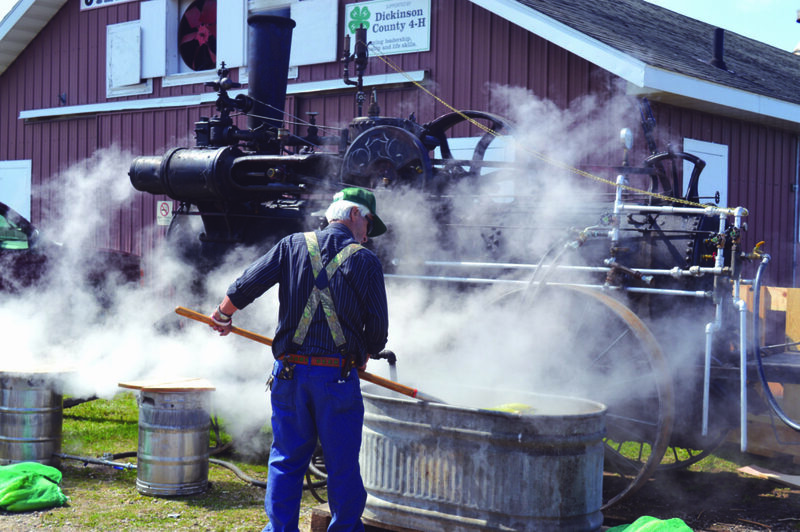 During the show, there will be threshing and hay baling demonstrations on the activities field; rock crusher, drag saw, shingle mill and steam-powered saw mill demonstrations will be held in Antique Village; the daily Equipment Parade starts at 1 p.m.; and the Engine Crank-Up starts each day at 2 p.m. Guests will also be able to enjoy the Antique Village’s agricultural museum, an antique automobile show featuring cars produced between 1900 and 1935, the sights and sounds of the Antique Village artisans, a knife and gun show, and one of the largest flea markets in the Upper Peninsula. For more information, visit www.upsteamandgasengine.org.